The Swedish Takeover Code is the Swedish equivalent of the UK City Code on Takeovers and Mergers. First published in the 1970s, it was largely based on the UK City Code, which served as its model. Since then, Sweden has witnessed a large number of public takeovers, many of them with a cross-border element. Historically, takeover activity on the Swedish stock market has always been more vibrant than in most European countries, and that continues to be the case to this day. 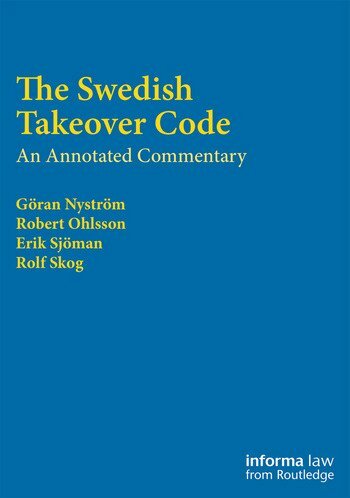 Available for the first time in English, this book is the leading commentary on the Swedish Takeover Code. Written by members of the Swedish Takeover Panel, who have been directly involved in the recent overhauls of the code, it is a vital reference for any companies, lawyers, bankers, financial regulators or policy makers participating in mergers and acquisitions involving Swedish stakeholders. Göran Nyström is a capital markets and public M&A partner at Vinge. He was for many years a member of the Swedish Takeover Panel. Robert Ohlsson is a partner at G. Nord Advokater and a member of the Swedish Takeover Panel. Erik Sjöman is a capital markets and public M&A partner at Vinge. He is a member of the Swedish Takeover Panel and Special Advisor to the Panel Executive. Professor Rolf Skog is the Director General of the Swedish Takeover Panel. He is a company law expert at the Swedish Ministry of Justice and an Adjunct Professor at the University of Gothenburg.